02/07/2009 - All countries need to trade, with their neighbours and globally, to sustain long-term economic growth. Some low-income countries lack the instutitions, infrastructure and supply-side capacity to benefit from open markets and lift their people out of poverty. The Aid for Trade Initiative, launched in 2005, encourages developing countries to make trade a priority and donors to supply new funds to help them build trade capacity. OECD and the WTO have been monitoring the results of the Initiative. The analysis and outcomes of the latest survey are presented in the joint OECD-WTO publication, Aid for Trade at a Glance 2009: Maintaining Momentum, launched by OECD Secretary-General Angel Gurría at the Global Review of Aid for Trade meeting in Geneva on 6 July. Secretary-General Angél Gurria presents "Aid for Trade at Glance 2009" at the WTO in Geneva on 6 July. 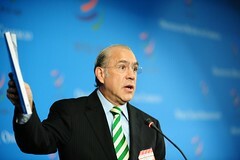 Mr. Gurría noted that, “More and better aid for trade is particularly important in the context of the crisis. It can help to build the capacity and infrastructure developing countries need to take full advantage of freer trade. Aid for trade should also support the broader development goals we all share, focusing not only on building trade capacities but contributing to a healthier environment and to fighting poverty.” Read the speech in full. Developing countries are using these funds to overcome infrastructure bottlenecks and to build their capacity in trade-related fields: aid targeted for economic infrastructure dominates (53%), followed by productive capacity (43%). Trade-related technical assistance accounts for the remaining 4% of total aid-for-trade flows. Aid for trade does not come at the expense of other assistance programmes - it is “additional” aid. Furthermore, OECD calculations show that 9 out of 10 aid-for-trade commitments have resulted in actual aid-for-trade projects and programmes. Finally, funding for global and regional programmes – identified as an area for special attention by the first Global Review – has more than doubled in volume since 2005. For further information or to obtain a copy of Aid for Trade at a Glance 2009, journalists are invited to contact Helen Fisher, OECD Media relations, at + 33 1 45 24 80 97 or by e-mail Helen.Fisher@oecd.org.